We’ve all heard that the right message to the right person at the right time is the best approach for eliciting action. Sounds simple enough. But who is the right person, what’s the right message, and when’s the right time? The answer typically comes down to relevance. The message and the timing must be relevant to the intended audience, and the best way to ensure relevance is to identify a common denominator. One way to find that common denominator is to set up a trigger marketing program. A trigger program leverages accurate and reliable data to send highly personalized mailings based on trigger touchpoints, which can produce significant response improvements. 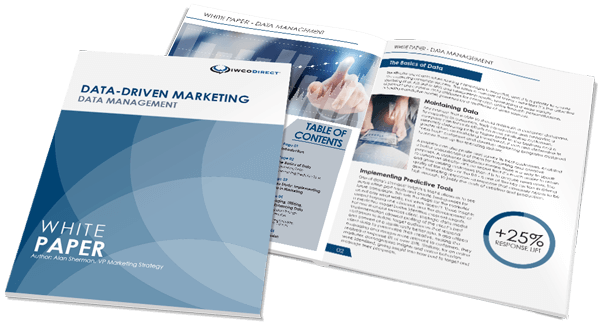 At IWCO Direct, we’ve seen trigger marketing programs significantly tip the marketing scales. As a matter of fact, our clients have experienced response rates from trigger campaigns that are up to ten times higher compared to traditional marketing campaigns. At its essence, trigger marketing is responding to specific behaviors or events by marketing to the prospect/consumer at a particular time. It’s all about the timing and reaching your audience when they are most receptive to learning more about (and hopefully purchasing) your product or service. These triggers may be based on life-stage events, but it’s certainly not mandatory. There are plenty of other consumer specific behaviors that can help provide the fuel for trigger programs. However, speaking of life events, let’s start there. One broad category of triggers is life events. Life-stage triggers address particular events in the life of a customer that present opportunities for marketers to acquire, retain, up-sell, and cross-sell products and/or services. In conventional direct marketing, a product or service is typically marketed by benefit. However, when it comes to triggers, reaching out to the audience based on where that product or service fits within their specific life stage has proven to be very successful. Milestone events like getting married, having a baby, moving into a new home, birthdays, anniversaries, etc., provide marketers with the opportunity to “trigger” a message in a very meaningful and relevant manner. This is a great opportunity for marketers, since consumers are more likely to purchase as a new life stage creates a new range of needs and wants. Although life-stage events tend to lend themselves well to trigger marketing programs, there are numerous other instances that sync well with specific prospect/consumer behaviors. It’s fitting that reminder programs come to mind. Customers are mailed six months, three months, and 30 days prior to the expiration of a current product. And there are many more—dental appointment reminders, car service notices, retail-specific purchase activities, loyalty programs, health care age-related check-ups, and the list goes on and on. Here at IWCO Direct, we have a program we call Registration to Conversion, which is a highly personalized and relevant trigger mailing. This mailing goes out to “warm leads,” or those who have registered for the product/service anywhere from 30 to 180 days earlier, but for one reason or another haven’t yet made it to the conversion stage of the prospect funnel. We’ve seen that this extra direct mail “nudge” is generating positive results for many of our clients, and is exactly what was needed to get the prospect over the hump, regardless of the vertical market. The basic premise of trigger marketing is certainly not limited to any specific industry. If the message is on point with the audience, relevant to the consumer’s needs or wants, and shows up at the ideal time, chances are good that you’ve found a winning program. IWCO Direct works with clients across all verticals, from financial service and insurance company event-based triggers, to OEMs’ and retailers’ registration to conversion campaigns, and everything in between. Again, it’s the right message, to the right audience, at the right time—and that just works across all industries, as well as B2C and B2B markets, plain and simple. Just as all clients are unique and possess idiosyncrasies, no two trigger programs are created identically, either. The type of client, the type of trigger, and the specific direct marketing strategy must all be taken into consideration and aligned. At the heart of all trigger programs, though, is the premise that they must be streamlined, produced, and delivered on a very timely basis in order to capitalize on the relevancy. This requires thinking through efficient and effective package design and how best to compress cycle turn times when compared to traditional cycles. If you’d like help with this approach to your marketing, please reach out, as we’re always happy to help you identify another tactic that will generate ROMI and tip the scales in your favor.